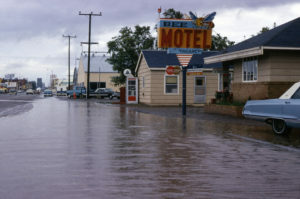 Flood in the 70s, Bee Motel to the right. Most of the buildings were moved to Sleeping Buffalo Resort. The site is now a casino and parking lot-just what Havre needs more of /s/.